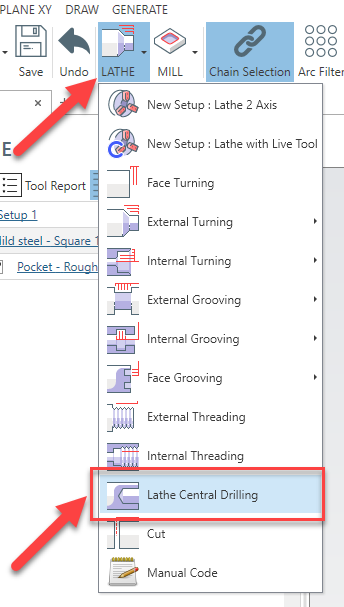 This is the machining property screen. For each operation you can define specific tool and a different depth value. You can change the suboperation order manually from treeview. See related link at the bottom of this article. When a drilling operation is selected, is possible see also "ghost tool model" at the minimum reached z. This is useful to check the tool path correctness at glance. Safe Z : It's the Z Level of approach . The tool arrives at this level in rapid. [Drill Operation] Add Drill Tip Length : It calculate the drill tool tip length and add it to inserted depth. The drill tip length is calculated by tool diameter and tool angle. You can edit this properties from tool edit screen. See related link below. [Chamfer] Define Chamfer Diameter : In chamfer operation is possible define the plain tool depth to execute or desired chamfer outer diameter. 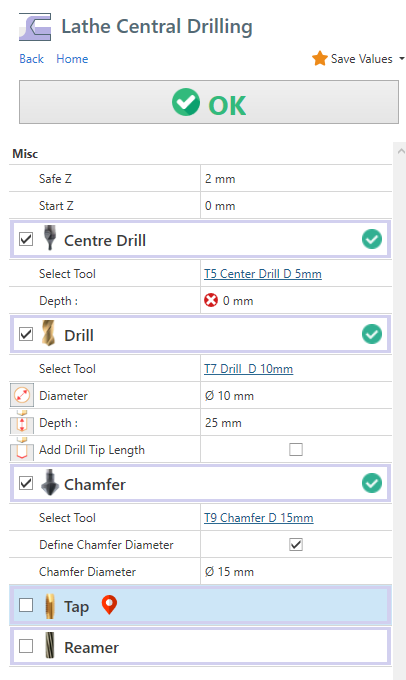 If you select to define the outer chamfer diameter, the effective tool depth will calculated automatically based on selected chamfer tool geometry.